2018 marked a year of anniversaries in the cigar industry. Many different companies and brands have different ways of commemorating such occasions. 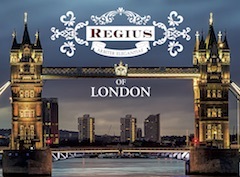 One denominator that is common to many of them is the release of a commemorative cigar for an anniversary. 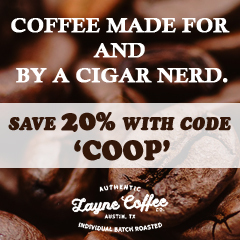 2018 is a big year for Joya de Nicaragua. 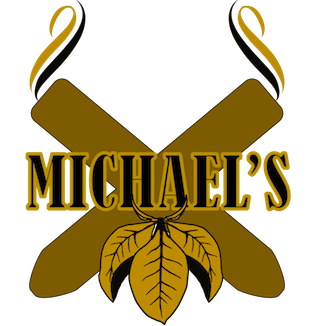 It’s the company that has the oldest factory in Nicaragua, and has very closely tied its brand to the history and culture of Nicaragua. Late last year, Joya de Nicaragua announced plans for how it would commemorate its 50th anniversary. It was a year-long celebration that included several cigars and even a book. 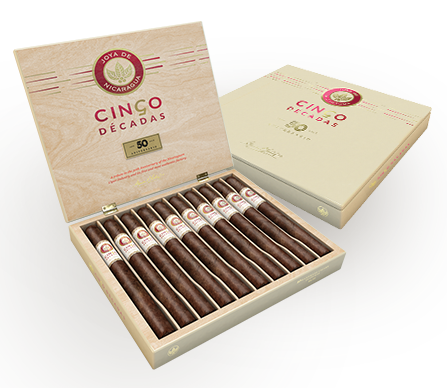 The centerpiece of the celebration would be the Joya de Nicaragua Cinco Décadas. Cinco Décadas means five decades and is the most premium release by Joya de Nicaragua to date. Today, we take a closer look at the Cinco Décadas in the El General (Double Corona) size. The Joya de Nicaragua Cinco Décadas will have an ongoing limited production of 5,000 ten-count boxes. 3,000 boxes will be available in the U.S. market for Drew Diplomat Retailers. 2018 has been one of the busier release cycles for Joya de Nicaragua. 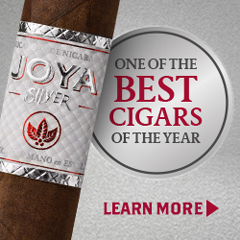 In addition to the Cinco Décadas, the company has also released the Joya Silver, the re-packaged Joya Clasico, and Joya de Nicaragua Antaño Gran Reserva Presidente for the TAA. 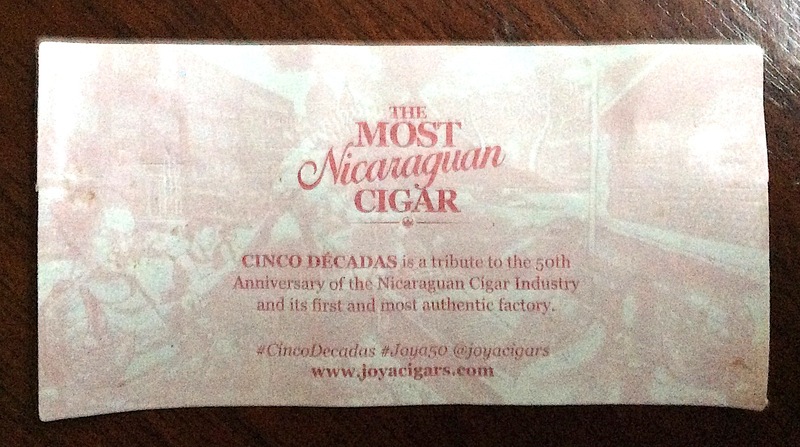 There are two sizes of the Joya de Nicaragua Cinco Décadas. 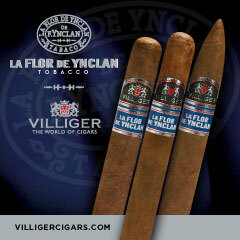 Joya de Nicaragua has said these vitolas are the first ones created at its factory. 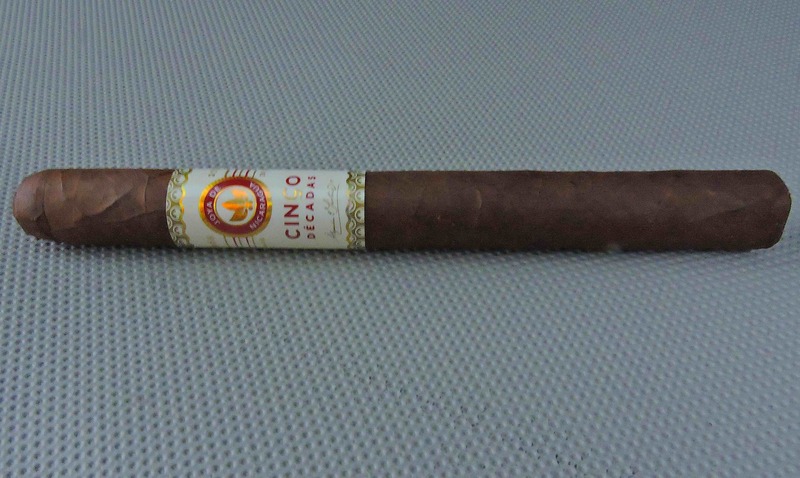 The wrapper of the Joya de Nicaragua Cinco Décadas El General had a dark cinnamon color to it. Upon closer examination, some mottling could be seen on the surface. There was a light coating of oil. The surface of the wrapper contained some visible veins and visible wrapper seams, but it still had an elegant look to it. The band features a glossy antique white background with red and gold accents. A red and gold Joya de Nicaragua logo is on the upper center the band with the leaf having a slight holographic effect. Below the logo is the text “CINCO DECADAS” in red font with the second “C” also having a holographic effect. Surrounding the leaf going clockwise from the upper left is the text “1968”, “2018”, “IN ESTELI”, and “HANDMADE” in gold font. The right side of the band contains a red background. In landscape mode is a large gold “50” with the text “1968” and “2018” surrounding it in a smaller gold font. Just below that is the text “ANIVERSARIO” in gold font. The band is finished with a gold trim with some holographic accents. There is text on the back of the band with a short mission statement on the Cinco Décadas cigar. The cigar experience of the Joya de Nicaragua Cinco Décadas El General was kicked off with a straight cut to remove the cap. From that point, the pre-light draw ritual was commenced. The dry draw had notes of rich natural tobacco and a slight cherry cream soda-like sweetness. There was also a touch of cedar and pepper spice present. I considered this to be an excellent pre-light draw. 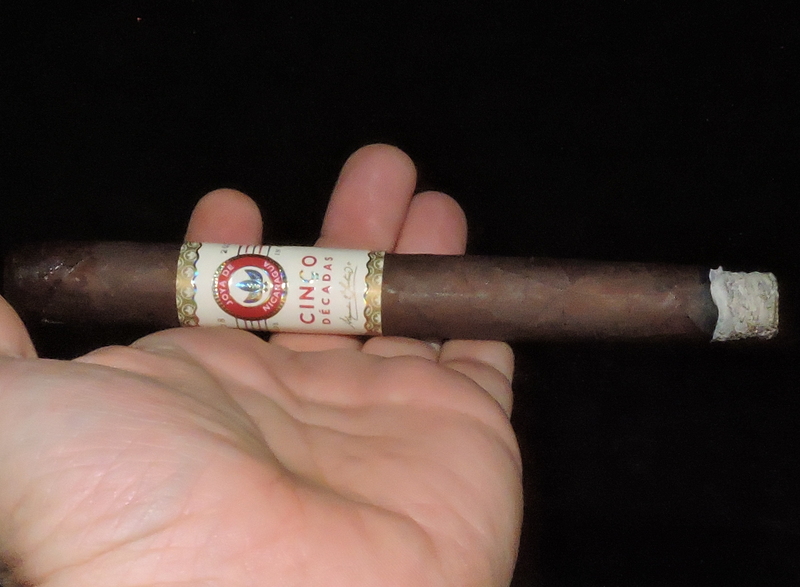 At this point, it was time to move on to the smoking phase and see what the Cinco Décadas El General had in store. The Cinco Décadas El General started out with a slight spurt of black and white pepper. The pepper receded into the background and notes of natural tobacco, earth, and the cherry cream soda-like note surfaced. 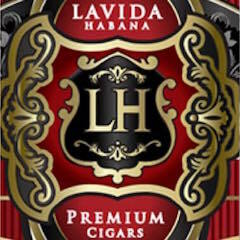 The combination of the natural tobacco and cherry-cream moved into the forefront. The earth joined the pepper in the background. During the first third, the pepper occasionally had short spurts of intensity and could be more prominently detected. There were also times the earth note made its way to the forefront. Meanwhile, there was an additional layer of black pepper on the retro-hale. During the second third, the cherry-cream note began to diminish in intensity. The natural tobacco remained grounded in the forefront. Concurrently the earth notes increased in intensity. By the midway point, the earth joined the natural tobacco in the forefront. The cherry-cream sweetness settled into the background with the pepper. It was also around the midway point where a cedar note surfaced and began to increase in intensity. By the last third of the Cinco Décadas El General, the earth notes took a slight edge in terms of being the dominant flavor. 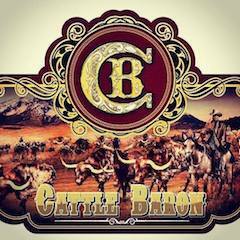 There was more of an increase in spice as the cedar notes closed in on the forefront. Concurrently there still were notes of pepper and cherry-cream. This is the way the Cinco Décadas El General came to a close. The resulting nub was firm to the touch and cool in temperature. 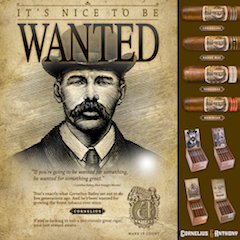 The burn of the Joya de Nicaragua Cinco Décadas El General had moments where there was a slight bit of waviness on the burn line, but this didn’t result in any excessive touch-ups and the cigar had no problem maintaining a straight burn path. The resulting ash had a slight firmness to it and it wasn’t prone to any flaking. The ash itself had a light gray color. As for the burn rate and burn temperature, both were ideal. As for the draw, the Cinco Décadas El General performed extremely well. This cigar had a touch of resistance. At the same time, this was a low maintenance cigar to derive flavor from – and there was a decent amount of smoke production. From a strength perspective, this was a cigar that didn’t knock you down with nicotine. 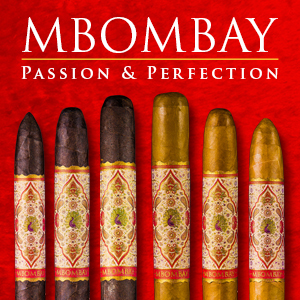 This cigar actually starts out as mild to medium before progressing to medium in the second half. The strength leveled off in the second half, remaining right in the middle of the spectrum. Meanwhile, the body of this cigar started out medium. There was an increase of body as well, but it never crossed into medium to full territory. Like the strength, the increase in the intensity of the body leveled off in the second half. Joya de Nicaragua had a very high profile 50th-anniversary celebration throughout 2018. All eyes were going to be on the Cinco Décadas, which was the signature release of the celebration. 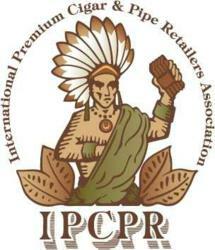 The cigar made its debut at the 2018 IPCPR Trade Show and among many media members, it was one of the cigars that garnered talk of being “the cigar of the show” – including this author. With the Cinco Décadas El General, Joya de Nicaragua delivers a cigar that excels in the most important category – flavor. 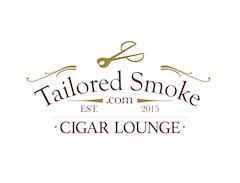 It’s a cigar that can also be enjoyed by a wide range of both novice and experienced cigar enthusiasts. At $18.95, it’s a pricey cigar – and one certainly in the ultra-premium category. It’s one that performs at a high level – and it’s one I’d easily reach for again. In my book, this cigar earns box worthy consideration. 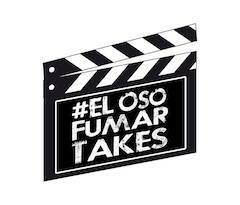 Cinco Décadas reviews so far, find out what the experts have to say! Check out the awards Joya de Nicaragua received in 2018!